A night light is a small device that provides gentle illumination in dark rooms and at night. They are much smaller than traditional lamps and can operate for days at a time if necessary. Most designs plug directly into an electrical socket and emanate light from the outlet. Others use batteries and hang on walls or baseboards. These designs use standard hooks and nails or adhesive strips to stay in position. Night lights are familiar to many people because they help to calm children who are afraid of the dark. They also have practical uses for adults. Night lights are a convenient option for good lighting in the home for several reasons. The lights are small and take up almost no space. They do not make it difficult to walk down stairs or along hallways because of the low profile of each unit. They generally only extend an inch or two beyond the wall. New energy-efficient models that use light-emitting diodes (LEDs) require an almost negligible amount of electricity to operate every night. Some units have motion sensors or light detectors that cause the night light to activate automatically when someone is nearby or the room is dark. Night lights are very safe and easy to operate. Some even have distinctive designs that match the decor of the home making it easy to disguise electrical outlets. Night lights will improve the quality of life for the people in a home in a variety of ways. The lights provide illumination at night that will help to prevent falls that could result in serious injuries. Marking hallways or doorways with lights will make it easier to move around the home at night without having to turn on bright overhead fixtures. Individuals who have vision problems or certain sleep disorders will find it easier to fall asleep at night if the room is not completely dark. Night lights are frequently used in the bedrooms of children who do not enjoy being along in the dark. Night lights are useful in a variety of situations. Installing a night light in the bathroom makes it easy for anyone to use the sink or toilet at night without having to turn on a bright overhead bulb that could cause vision problems and make it hard to get back to sleep. It is also common to find a night light in the kitchen where someone might want to get a glass of water in the middle of the night. Some people use night lights in the living room in order to provide a small amount of light while watching a movie or relaxing. The lights are invaluable on staircases or around areas where there are changes in elevation. The small amount of illumination will prevent falls and foot injuries. 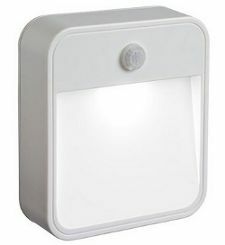 Recommended Motion Sensor Lights – Provides long lasting light on a few batteries. The LED technology also assures a very long light life. Bright enough to help you see through the night but not too bright where it is blinding at night. Even the highest quality night lights with motion sensors are relatively inexpensive. The majority of models available cost only a few dollars. There are now several types of night lights available. Some use small traditional incandescent bulbs that eventually burn out and require replacing. Designs that are more modern use LEDs that last for tens of thousands of hours and do not need replacing. The most common maintenance performed on a night light is regular dusting to keep the unit clean.